If you're obsessed with practicality dressing when it comes to fashion, you'll love this cute combo of a tan oversized sweater and black ripped skinny jeans. Choose a pair of beige suede ankle boots to kick things up to the next level. For an outfit that provides comfort and style, marry a black cape coat with black leather skinny jeans. When it comes to footwear, this outfit pairs nicely with Hogan shearling ankle boots. If you're searching for a casual yet stylish getup, opt for a pink silk blazer and white lace shorts. Both garments are totally comfy and will look fabulous together. Bump up the cool of your outfit by finishing off with Hogan shearling ankle boots. If you're on the lookout for a casual yet totally stylish getup, choose a black shearling jacket and charcoal jeans. Both garments are totally comfy and will look fabulous paired together. Dress up this outfit with Hogan shearling ankle boots. 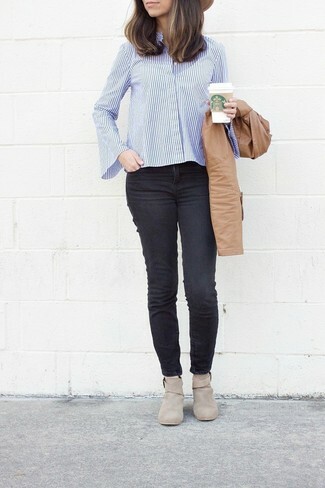 If you're hunting for a casual yet chic look, opt for a beige blazer and black ripped skinny jeans. Both garments are totally comfy and will look fabulous together. You could perhaps get a little creative when it comes to footwear and dress up your ensemble with Hogan shearling ankle boots. This combo of a charcoal open cardigan and charcoal flare jeans is clean, absolutely chic and oh-so-easy to imitate! Bring a touch of sophistication to your look with Hogan shearling ankle boots. If you're a fan of relaxed dressing when it comes to fashion, you'll love this adorable pairing of a dark green crew-neck sweater and black ripped skinny jeans. 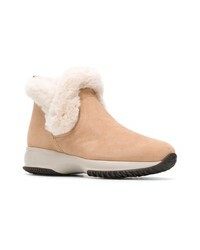 Bump up the cool of your outfit by completing it with beige suede ankle boots. If you're scouting for a casual yet chic outfit, pair a tan leather bomber jacket with black skinny jeans. Both items are totally comfy and will look fabulous together. 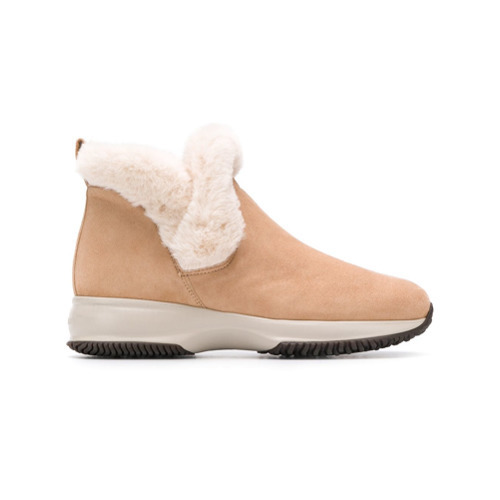 Make Hogan shearling ankle boots your footwear choice to va-va-voom your outfit. If you're looking for a casual yet absolutely chic getup, team a beige shearling jacket with grey jeans. Both items are totally comfy and will look fabulous paired together. Opt for a pair of Hogan shearling ankle boots to take things up a notch.